Communion, they should receive the Sacrament of Confirmation which will make them strong Christians and soldiers of Jesus Christ - equipped with the graces to face a hostile and materialistic world. 􀀾􀀃We will call a priest when sickness strikes us down. Extreme Unction should be received, if possible, while a person is conscious. 􀀾􀀃We shall reverence the priesthood, and pray for our priests so that they may work worthily for the good of our souls. 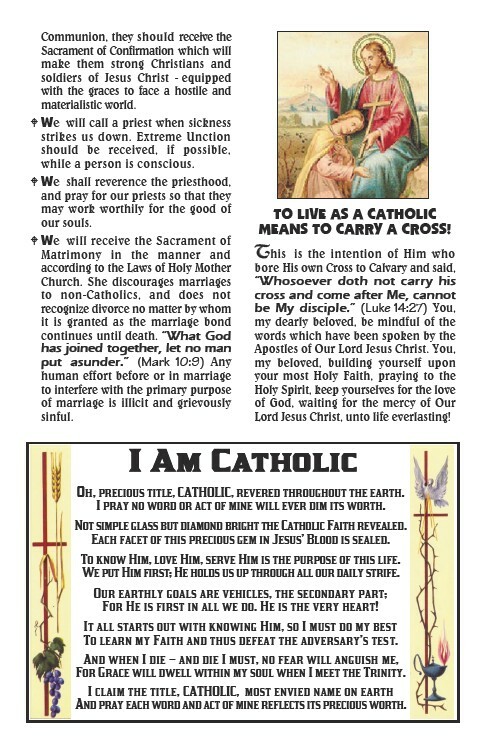 􀀾􀀃We will receive the Sacrament of Matrimony in the manner and according to the Laws of Holy Mother Church. She discourages marriages to non-Catholics, and does not recognize divorce no matter by whom it is granted as the marriage bond continues until death. “What God has joined together, let no man put asunder.” (Mark 10:9) Any human effort before or in marriage to interfere with the primary purpose of marriage is illicit and grievously sinful. TO LIVE AS A CATHOLIC MEANS TO CARRY A CROSS! This is the intention of Him who bore His own Cross to Calvary and said, “Whosoever doth not carry his cross and come after Me, cannot be My disciple.” (Luke 14:27) You, my dearly beloved, be mindful of the words which have been spoken by the Apostles of Our Lord Jesus Christ. You, my beloved, building yourself upon your most Holy Faith, praying to the Holy Spirit, keep yourselves for the love of God, waiting for the mercy of Our Lord Jesus Christ, unto life everlasting! Oh, precious title, CATHOLIC, revered throughout the earth. I pray no word or act of mine will ever dim its worth. Not simple glass but diamond bright the Catholic Faith revealed. Each facet of this precious gem in Jesus’ Blood is sealed. To know Him, love Him, serve Him is the purpose of this life. We put Him first; He holds us up through all our daily strife. Our earthly goals are vehicles, the secondary part; For He is first in all we do. He is the very heart! It all starts out with knowing Him, so I must do my best To learn my Faith and thus defeat the adversary’s test. And when I die – and die I must, no fear will anguish me, For Grace will dwell within my soul when I meet the Trinity. I claim the title, CATHOLIC, most envied name on earth And pray each word and act of mine reflects its precious worth.